Lennon rubbishes Liverpool's interest in striker | The Transfer Tavern | Where football transfer rumours fly or die! Liverpool fans in the Football Transfer Tavern were stunned to read of the Reds interest in Celtic striker Georgios Samaras on Saturday, however Scottish journalist Tom English was on hand to dismiss the idea after speaking to Neil Lennon. 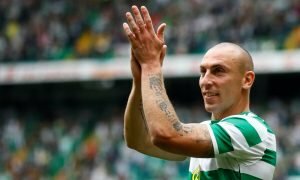 The Hoops manager told The Scotsman that it was purely rumours and that he’d be surprised if the Greek forward wanted to leave the club after his recent heroics in the Champions League. “It’s just speculation, someone taking a flyer,” said Lennon after their comprehensive 3-1 win against Kilmarnock where Samaras netted the third. The Greek star was linked with a £5 million switch to Anfield in a number of yesterday’s papers after his performances for the Scottish side during their remarkable Champions League campaign. However Liverpool fans won’t be too surprised that it is unlikely to happen. Samaras to Liverpool? A bad joke or a viable transfer option? Vote in our polls below.